Cornerstone Guesthouse - Swakopmund Accommodation. Within a few minutes from the guest house you can walk to beaches, cafes, restaurants, lively pubs, Swakopmund tourist attractions and a variety of interesting shops and markets in the town. 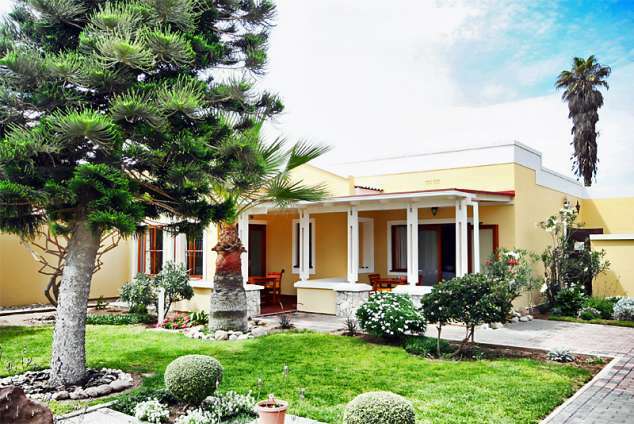 Cornerstone Guesthouse offers bed and breakfast accommodation in 5 double/twin en-suite rooms plus a family room, en-suite that can take up to 4 guests. The rooms each have a private entrance and patio with table and chairs; inside, the rooms are light, spacious and neat with tile and wood floors, beach house colours and your choice of double or twin beds. The breakfast room at Cornerstone Guesthouse is large, light and airy. You can sit on the verandah on warm days or inside at individual tables. We offer an inclusive breakfast with a fresh selection of fruits, juices, yoghurts, breads, preserves and eggs and bacon cooked to order. Wash that all down with our freshly brewed coffee or your choice of tea and you'll be ready to explore the attractions of Swakopmund and the Skeleton Coast. delightful Tug Seafood Restaurant both overlooking the sea. route north or south between Etosha and Sossusvlei. flights. Soon you will be able to fly directly to the coast from Europe. 18124 page views since 02 Jul, 2008.